This past week, Kīlauea Volcano’s summit lava lake fluctuated in concert with summit inflation and deflation, with levels ranging 28–52 m (92–171 ft) below the vent rim. On the East Rift Zone, the 61g flow remained active, with lava entering the ocean near Kamokuna. Near Pu‘u ‘Ō‘ō, flows continued on the upper portion of the flow field. The 61g flows do not pose an immediate threat to nearby communities. Mauna Loa is not erupting. During the past week, only a few small-magnitude earthquakes occurred beneath the volcano, primarily in the south caldera and upper Southwest Rift Zone at depths less than 5 km (3 mi). A few earthquakes also occurred on the west flank of the volcano at depths of 0–13 km (0–8 mi). Global Positioning System (GPS) and Interferometric Satellite Radar (InSAR) measurements continue to show deformation related to inflation of a magma reservoir beneath the summit and upper Southwest Rift Zone. No significant changes in volcanic gas emissions were measured. Two earthquakes were reported felt on the Island of Hawaiʻi during the past week. On June 28, 2017, at 6:58 p.m. HST, an offshore magnitude-2.5 earthquake occurred near the submarine volcano Lō‘ihi, 42 km (26 mi) southeast of Pāhala, at a depth of 12.5 km (7.8 mi). On June 26, at 11:27 p.m. HST, a magnitude-2.4 earthquake occurred 4 km (2.5 mi) southeast of Leilani Estates at 1 km (0.6 mi) depth. 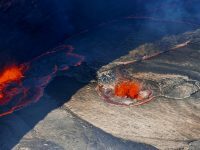 Please visit the HVO website (volcanoes.usgs.gov/hvo) for past Volcano Watch articles, Kīlauea daily eruption updates, Mauna Loa weekly updates, volcano photos, recent earthquakes info, and more. Call for summary updates at 808-967-8862 (Kīlauea) or 808-967-8866 (Mauna Loa). Email questions to askHVO@usgs.gov.